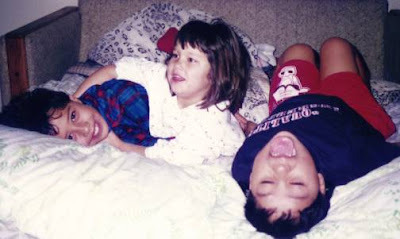 My cousin Pepe combs my hair back just like his, and Aunt Pilar laughs. Then she slides her red lipstick across my lips, but Mamá wipes it off because I’m too young. Mamá puts on her new jeans, and Aunt Pilar polishes her high heels. Uncle Armando finishes washing his old car. I know that once I outgrow my boots, I may not get the red ones with the fringe and the silver tips. I know that I may not get a new bike. But what I do have is an uncle who will carry me and my sleepy cousins to bed. I have an aunt who lets me pretend to be grown-up. I have a mother who tells me stories at night. And I have my cousins Pepe and Edgar beside me to share every Sunday on Fourth Street. Several years ago, when I sent my first manuscript to a publisher, I got a hand-written note, suggesting I write a story about Día de Los Muertos or Cinco de Mayo. Hungry for an acceptance letter, I really tried to write those books, but it didn’t work. Those weren’t the stories in my heart. I wanted to write about every day, not holidays. My efforts of write a story about my dead grandmother turned into my second book, Abuelita Full of Life. 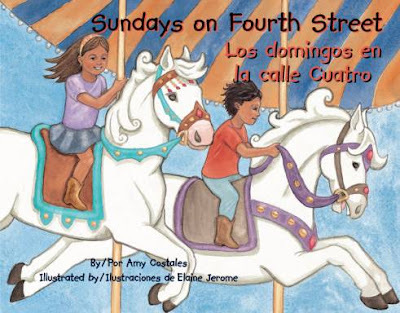 As for the Cinco de Mayo book, well, I set it in Santa Ana, but I couldn’t get away from memories of my daughter and her two cousins on Sunday excursions to Fourth Street. I ended up celebrating, not a holiday, but two things important to me; extended family and every day life on Fourth Street. It was bitter-sweet writing this book. My nephews, who spent almost their whole lives in California, had just been deported to Mexico. Edgar is working with his dad near Toluca, Pepe is in university in Tampico, and Kelsey is in university in Oregon. A young girl enjoys her family's weekly trip to Fourth Street, where she and her cousins eat mangos and tacos, look at clothes and shoes, watch all the people on the busy street and take care of such chores as haircuts and grocery shopping. Elaine Jerome grew up with a love of travel after living in both Hong Kong and New York as a child. She has a background in both art and science, and finds illustrating for children a field that unifies her past experiences. She is the illustrator of The Woodcutter's Gift / El regalo del leñador (Piñata Books, 2007). 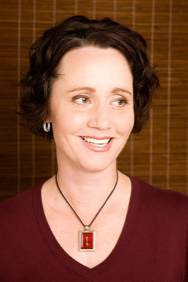 Elaine currently resides in Lake Tahoe, where she and her husband enjoy snowboarding together. To see more of Elaine's work, visit www.jeromeillustration.com. What a touching story. I am glad Amy stuck to writing what was in her heart and about everyday life. Bilingual and multicultural books need not only be about holidays and big picture themes. They can and should be about everyday life! Kudos to Amy Costales!